Part 28 of Wonders of World Engineering was published on Tuesday 7th September 1937, price 7d. 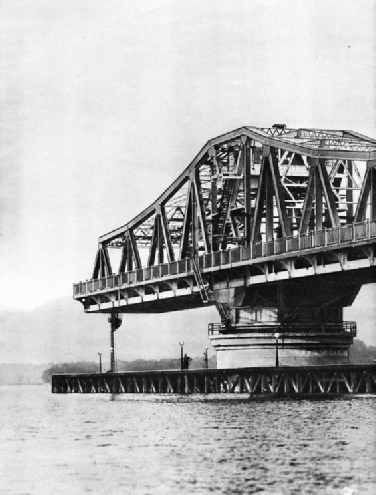 Part 28 includes a photogravure supplement showing the construction of the Kincardine Bridge, which illustrates the article Europe’s Longest Swing Bridge. 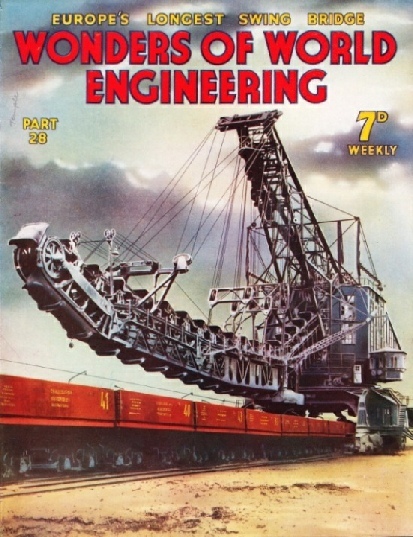 The subject of this week’s cover is a giant excavator used for removing the overburden in the brown-coal mines of Germany. To uncover the deposit, double lines of railway track are laid along the edge of the cut. On these lines, and carried on 240 wheels, runs the excavator, to that the full length of the cut can be traversed. Between them lies another railway track for the wagons in which the spoil is dumped. The working part of the excavator consists of a boom on which is carried an endless chain of dredger buckets. An account of how the engineer battles against the might of the Mississippi River. The article is concluded from part 27. Across the Firth of Forth at Kincardine is a magnificent road bridge whose central span, 364 feet long, is pivoted on a central pier. This span is opened by electric controls to allow the passage of shipping. 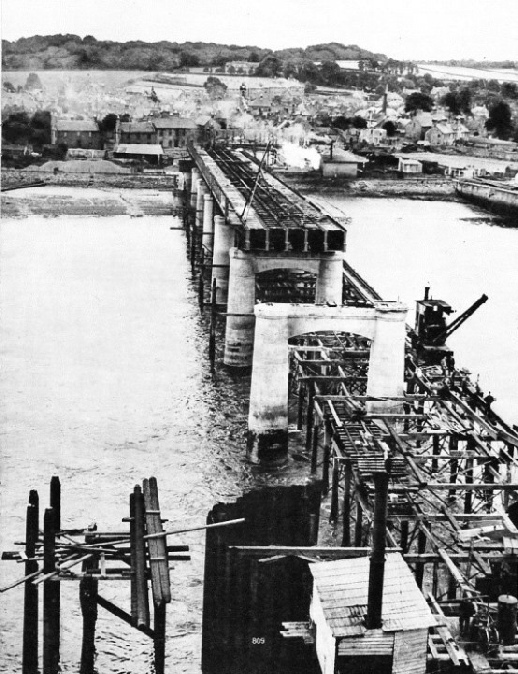 The article describes the building of the Kincardine bridge. In addition to having the longest swing span in Europe, this new bridge has the distinction of being the longest road bridge in Great Britain, with a total length of 2,696 feet. A remarkable feature of the bridge is the electric control of the opening and closing of the swing span. This chapter is by F E Dean and is the tenth article in the series Linking the World’s Highways. Increasing use is being made to-day of gas for propelling motor lorries and cars. The gas is generated on the vehicles themselves from solid fuel such as charcoal or coke, and road tests have proved the producer-gas method of propulsion to be efficient and economical. This chapter is by Sidney Howard. 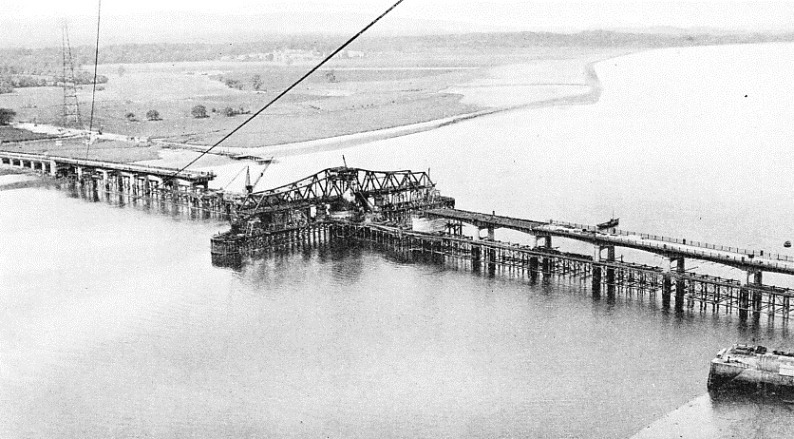 FOUNDATIONS FOR THE CENTRAL PIER of Kincardine Bridge were made by sinking to rock level, under air pressure, six cylinders with a diameter of 14 ft 6 in. The cylinders were lowered by hydraulic jacks. 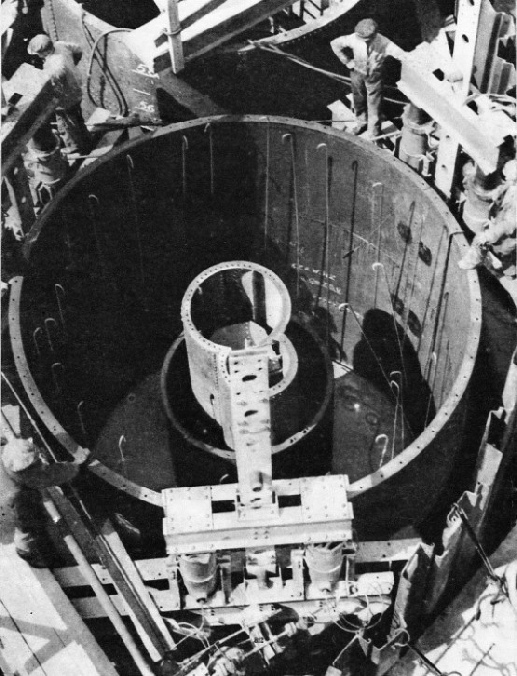 Concrete was placed between the cylinder walls and the circular shuttering round the air shaft. As the concreting proceeded the jacks were adjusted and the cylinders sank slowly to their foundations. PRODUCER-GAS PLANT can be fitted to an ordinary internal combustion engine, or else a specially designed engine can be installed on the chassis. The car illustrated is fitted with a Koela plant, and in an RAC rally in 1934 this car completed 1,000 miles on 660 lb of charcoal and six gallons of petrol. 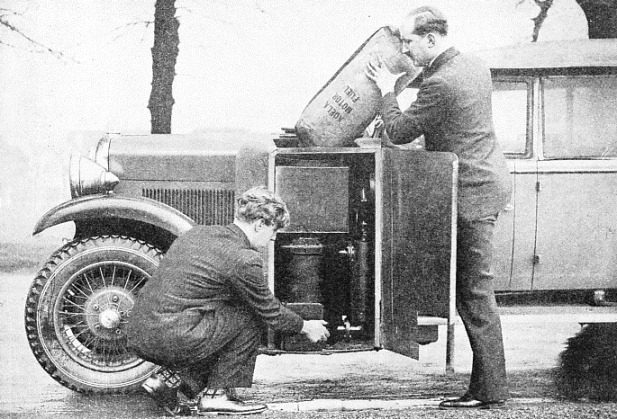 The petrol was used for various tests. 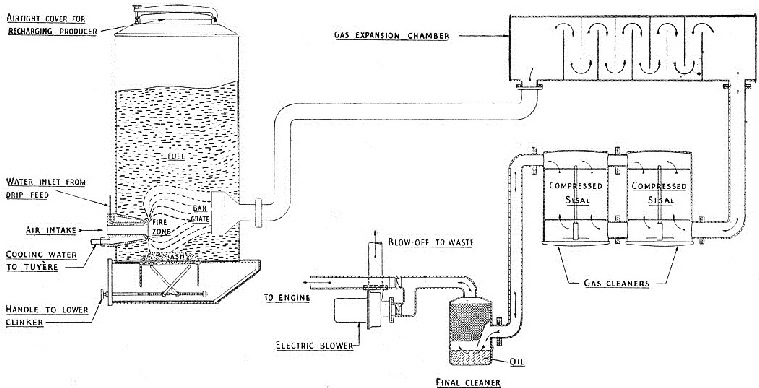 Solid fuel is emptied, as shown, into a hopper above the firebox of the producer. THE SWING SPAN of Kincardine Bridge is 364 feet long, the longest swing span in Europe. Despite its great weight of 1,600 tons, the span is operated by electrical machinery that completely opens and shuts the bridge on a consumption of only 2.1 units of electricity. A timber jetty, 470 feet long and 50 feet wide, extends round the central pier. At either end of the jetty are semaphore signals for the guidance of shipping. ARRANGEMENT OF PRODUCER-GAS PLANT as designed by Gilfords (HSG) Ltd, for road vehicles. The producer is an unlined mild-steel cylinder about 2 feet high, filled with fuel from the top. A water-cooled tube known as a tuyère (left) admits air into the fuel at high velocities. Water passed into the fire from a drip feed forms an aqueous envelope round the fire zone. The gas produced first passes to the expansion chamber, a cylinder fitted with baffles, and then through the cleaners, where compressed sisal extracts carbon and other impurities. The gas then passes through the final cleaner to the engine. 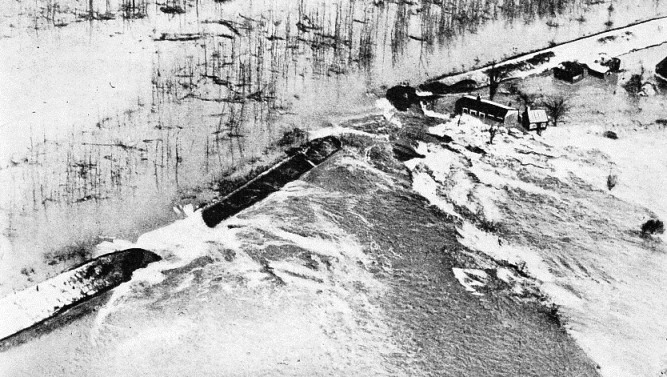 THE FULL FURY OF THE RIVER released by blasting the levees near Cairo (Illinois). In a final effort to save that city from the flood waters in January 1937 the engineers, despite resistance from local farmers, blew up the levees and flooded 131,000 acres of rich farm land. Such drastic measures often have to be used when the situation becomes serious. 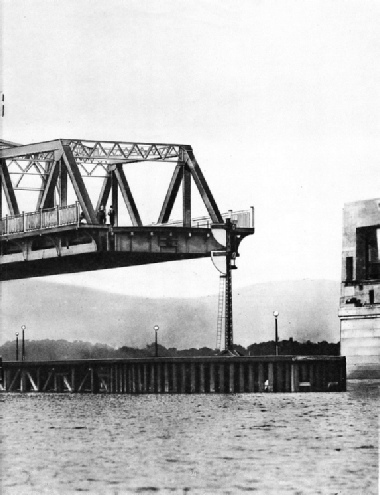 GIRDERS OF THE 100-FEET SPANS were placed in position from the temporary bridge shown on the right of the photograph. Two girders were handled at a time. Those on the upstream side were rolled by jacks across steel balls in V-shaped tracks along the tops of the piers.. The development of the canning industry in recent years has entailed a remarkable increase in the manufacture of tinplate, which is made from steel into containers of every shape and size. One of the advantages of our present civilization is that we have learnt how to preserve food - the first essential of life - so that it will not deteriorate in any climate and will keep for an almost unlimited period. The containers in which food is carried are made mainly from steel. The steel is subjected to many processes until the metal has acquired all the properties necessary for the successful preservation of food. Then the containers are made from sheets by an amazing series of machines. The cans are filled and then sealed - all by specially devised and ingenious machines. These processes are described by Sidney Howard in this chapter. 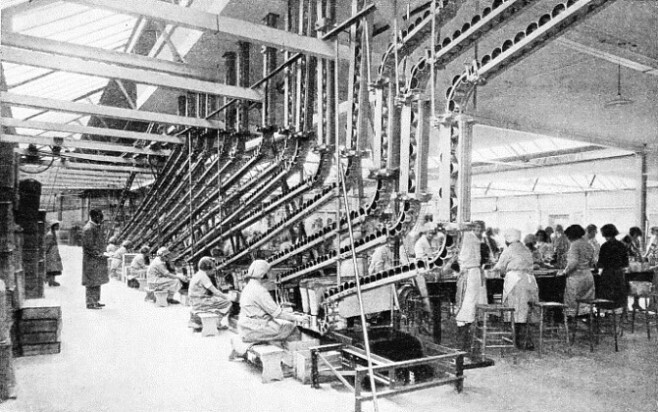 It is the tenth article in the series on the Romance of Industry. IN A FRUIT CANNING FACTORY the cans are handled by a system of conveyers and the fruit is placed in the containers without being touched by hand. At the inspection belts behind the conveyers fruit is being examined before it passes to the fillers. The fillers are operated by girls, one of whom is seated at the foot of each conveyer. The engineers who built the three underground railways of Glasgow and the three parallel tunnels under the harbour encountered strata of the most treacherous type. Many difference systems of tunnelling had to be used. This chapter is by C Hamilton Ellis and is the seventh in the series Below the Surface. The article is completed in part 29. 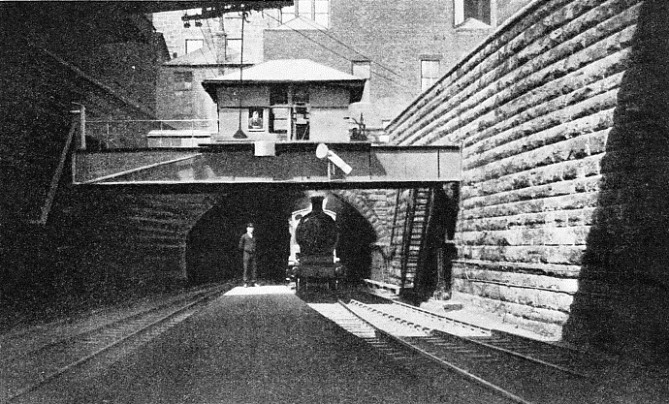 AIR SHAFT at Queen Street (Low Level) Station, on the Glasgow City and District Railway. The railway was built mainly on the cut-and-cover principle. A trench was cut, the tunnel built in it, and then the ground was put back on top of the tunnel.